Posted on April 23, 2015 by staceyanderton1	in Sports and tagged Panther Football, Saegertown Football, Saegertown Panthers, SHS Football. 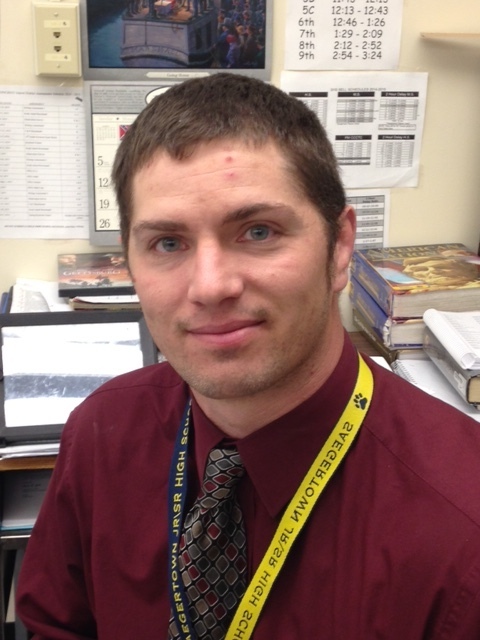 Social studies teacher Mr. Adam Horne was introduced as the new head football coach at Saegertown High School on April 22 during a tutorial meeting for next year’s football team. Horne is taking over for former head coach Mike Rhoades. “I’m optimistic about the upcoming year. I am pleased with the number of kids that are participating in our lifting program,” said Horne. Lifting takes place on Tuesdays and Thursdays after school. Horne is a promoter for lifting and cardio workouts.“You have to be in shape to play the game the way it’s meant to be played. Usually when we are tired is when we make mistakes,” he said. Students who want to play football this upcoming year will need to fill out a Saegertown Football paper. These forms can be found in the office. The 2015 football season kicks off Sept. 4, at 7 p.m. against Mercyhurst Prep.